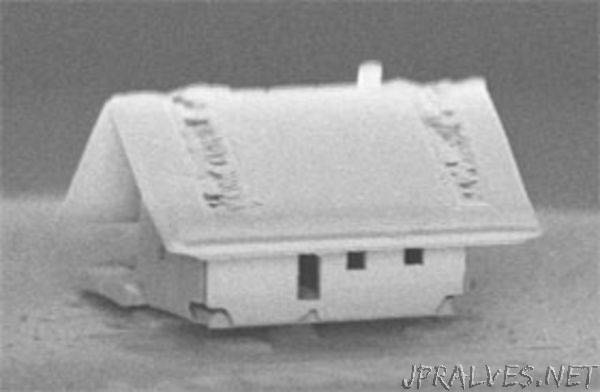 Robotic Assembly of the World’s Smallest House — Even A Mite Doesn’t Fit Through the Door! “Nanorobotics team demonstrates their new capability to manufacture optical nanotechnologies. A French nanorobotics team from the Femto-ST Institute in Besançon, France, assembled a new microrobotics system that pushes forward the frontiers of optical nanotechnologies. Combining several existing technologies, the µRobotex nanofactory builds microstructures in a large vacuum chamber and fixes components onto optical fiber tips with nanometer accuracy. The microhouse construction, reported in the Journal of Vacuum Science and Technology A, from AIP Publishing, demonstrates how researchers can advance optical sensing technologies when they manipulate ion guns, electron beams and finely controlled robotic piloting. The French engineers combined all the technological components for nanoassembly — a focused ion beam, a gas injection system and a tiny maneuverable robot — in a vacuum chamber, and installed a microscope to view the assembly process. “We decided to build the microhouse on the fiber to show that we are able to realize these microsystem assemblies on top of an optical fiber with high accuracy,” Rauch said.